The upcoming Magnificent Jewels sale, that will take place at Christie’s in Geneva next November 15th, will offer an impressive array of coloured gemstones, signed jewels and important jewels with provenance, with a worldwide première. The best way to celebrate the Auction House’s 250th Anniversary. Bulgari, Cartier, Van Cleef & Arpels, David Webb, Harry Winston… all the most prestigious and recognized brands will be featured during the upcoming Magnificent Jewels sale, dazzling the salesroom with their refined and very important creations. This auction is even more special as it will feature a world première: the brand new High Jewellery Maison Boehmer et Bassenge has in fact chosen this special event to launch their very first High Jewellery creations, Le Jardin d’Isabelle necklace and the Miroir de l’Amour earrings. Two stunning and superb creations, featuring the very top diamonds Nature can offer (they are all D/Flawless, the earrings boasting the largest pear-shaped diamonds ever offered at auction), that will be exceptionally offered without reserve (you can discover these marvels in my previous post). Among coloured diamonds, one that will not go unnoticed is this rare Fancy Vivid Pink pear-shaped diamond, weighing 9,14 carats, set between tapered baguette-cut diamond shoulders and mounted in platinum. The beauty, and high value, of this diamond resides in the absence of a secondary colour, making it extremely attractive and rare. To add to this marvel, a Cartier Diamond Parure, and a Diamond Ring, always by Cartier. Comprising: a circular, marquise and pear-shaped diamond V-shaped necklace, suspending a detachable pear-shaped diamond pendant, weighing approximately 20.40 carats, 41.0 cm; and a pair of earrings, each similarly-set spray cluster surmount, suspending a detachable pear-shaped diamond pendant, weighing approximately 5.02 and 5.01 carats, 5.0 cm, all mounted in gold. Set with a pear-shaped diamond, weighing approximately 14.18 carats, between tapered baguette-cut diamond shoulders, ring size 6, mounted in gold. Among all the beautiful pearl jewels that will be offered next week in Geneva, one among all got my attention: the Putilov Pearl. THE PUTILOV PEARL A MID-19TH CENTURY EXCEPTIONAL NATURAL PEARL AND DIAMOND BROOCH Centering a button-shaped natural pearl, measuring approximately 18.75-19.05×16.15 mm, within an openwork foliate diamond-set frame, to the old-cut diamond surround, 1860s, 5.0 cm, mounted in silver and gold. Nikolai Putilov, a retired official from the Naval ministry, purchased The Kirov Plant (a major industrial factory in St. Petersburg that served as a foundry for cannonballs) in 1868, and renamed it The Putilov Company. The factory bore his name beyond his death, in 1880, during which the factory produced the largest share of Russia’s steel rails, and gathered nearly a quarter of all state orders for locomotives and wagons. It is easy to imagine how Putilov was a man of wealth and resources, and a great admirer of jewellery (he was one of Fabergé’s most affectionate clients). With the revolution, Lenin signed a decree to confiscate Putilov’s wealth, forcing him to flee Russia for Paris. Putilov managed, nonetheless, to smuggle with him some of his jewels, among which this superb pearl brooch, which was passed down through the family. Given this jewel’s history, to find it in such a perfect condition makes this brooch a real treasure. Blue is for sure a dominant colour at this autumnal session of Christie’s Magnificent Jewels sale. Set with an octagonal step-cut sapphire, weighing approximately 14.65 carats, between rectangular-cut diamond shoulders, ring size 4 ¾, with French assay mark for platinum. Each octagonal step-cut sapphire, weighing approximately 8.52 and 7.32 carats, within a square-cut diamond surround, to the diamond-set double line suspension and surmount, 4.5 cm, mounted in platinum. Rubies are equally superb, my favourite being this Exceptional Ruby and Diamond Ring, featuring a Burmese oval-cut “pigeon blood” ruby of 7,08 carats. Accompanied by report no. 87463 dated 29 August 2016 from the SSEF Swiss Gemmological Institute stating that the origin of the ruby is Burma (Myanmar), with no indications of heating, and that the colour may also be called ‘pigeon blood red’, an Appendix letter and a Premium book. Report no. 16037100 dated 3 March 2016 from the Gübelin GemLab stating that the origin of the ruby is Burma (Myanmar), with no indications of heating, and that the colour may also be called ‘pigeon blood red’, an Appendix and two Information sheets on ‘Rubies from Mogok, Burma’ and ‘Unheated rubies’. All the lots of this sale would deserve their highlight, they are all superb and impressive in their own way. But let us close this brief overview with two more marvels: The Star of Sierra Leone VI, and Countess Mona Bismark’s Cartier Diamond Bracelet. The Star of Sierra Leone VI is the 6th of seventeen polished diamonds (thirteen of them are flawless, totalling 238,48 carats) obtained by the The Star of Sierra Leone, a rough of 968,9 carats that was discovered in 1972, on Valentine’s Day. De Beers handled the sale, and the rough became property of Harry Winston, who took care of the studying and cutting. A DIAMOND RING, BY HARRY WINSTON Set with a pear-shaped diamond, weighing approximately 21.69 carats, to the baguette-cut diamond tapered shoulders, ring size 5 ½, mounted in platinum. 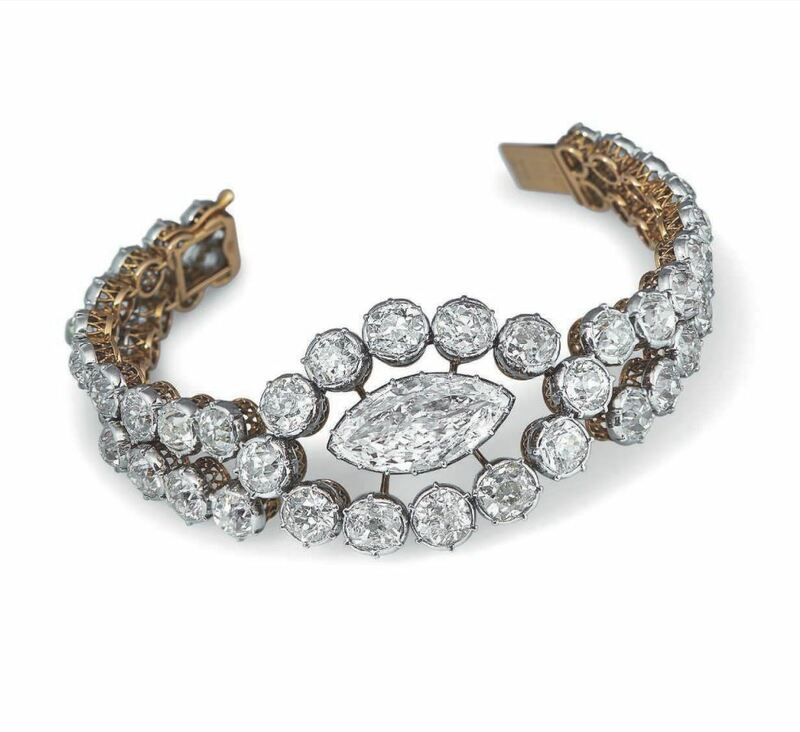 Last but not the least, one of the jewels I adored the most, of fascinating provenance: Countess Mona Bismark’s Diamond Bracelet, signed by Cartier. Photo by George Hoyningen-Huene/Condé Nast via Getty Images. “The legendary Mona Bismarck (née Strader), 1897-1983, lived a glamorous and luxurious life, defying convention and later sharing her good fortune to support the arts, fashion and culture. Following her marriage in 1926 to Harrison Williams, reputed to be among the wealthiest men in America, Mona swiftly became known as one of the most glamorous and beautiful women in New York, and was named “the best-dressed woman in the world” by contemporaneous arbiters of fashion. Cartier has always had high-ranking clients, and Mona was one of them. By establishing a close relationship with the Maison, she created, designed and re-designed her jewels. This splendid diamond bracelet, mounted by Cartier on the basis of a 19th century design, personifies the Countess’ trendsetting taste and elegance. All material courtesy of Christies.